Wheel spacers and wheel adapters are invaluable when installing custom wheels and tires, but what are wheel spacers and adapters, and what are the benefits of wheel spacers and adapters? Typically used to install larger tires, wheel spacers are devices that fit over a vehicle’s holding bracket to create extra clearance between the wheel and the wheel hub assembly. In other words, wheel spacers increase the offset or the distance between the wheel and the wheel hub assembly. Wheel spacers are matched with a vehicle’s bolt pattern and fit over the existing studs, allowing the wheel to be mounted normally. Without wheel spacers certain custom wheels would sit too close to the existing component of the vehicle such as the inner wheel well. Beside the obvious benefit of allowing larger tires to be mounted on a vehicle, wheel spacers also can lead to increased vehicle performance and a more unique appearance. Many people use wheel spacers in order to increase their vehicle’s handling, namely it’s traction. The further a wheel is mounted from the hub assembly the better its grip, or traction, is when cornering, to an extent. And because the wheels sit further away from the hub assembly when using wheel spacers the traction that a vehicle has when cornering is improved. Wheel spacers are also used merely to extend the wheels outward from the vehicle to give it a more interesting look. 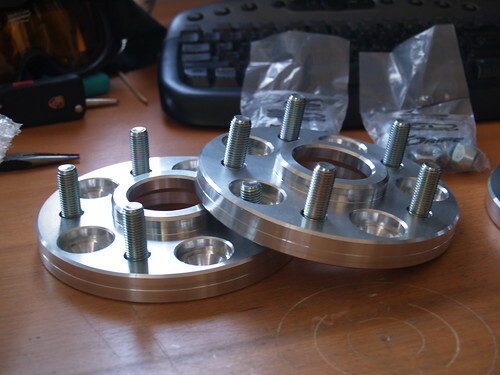 Wheel adapters on the other hand, are discs that can be mounted on a vehicle’s wheel hub assembly to change the existing bolt pattern; for instance, the right wheel adapter can change a vehicle’s bolt pattern from a 4-bolt pattern to a 6-bolt pattern. The obvious benefit of using wheel adapters is that they allow people to mount custom wheels to their vehicle, regardless of bolt pattern. Using wheel adapters also increasing the offset of a vehicle’s wheels, which in turn can increase the handling of vehicle, much like wheel spacers. Furthermore, since people are not restricted to using one particular bolt pattern for their vehicle they can often select tires and wheels that are larger, smaller, or plainly match the vehicle’s appearance better. If you’re planning on installing wheel spacers and adapters onto your vehicle it’s often a good idea to also install longer bolts or studs so that the lug nuts on the wheel can be properly fastened. And it’s always good practice when mounting wheels to make sure that all of the lug nuts are fastened securely as well, especially when using any wheel spacers or adapters. The many benefits of wheel spacers and adapters won’t mean much if your tires are mounted properly. I have a 2011 Chevy 2500 hd Duramax that has the factory sized tires, 265 60r20. If I add 2″ wheel spacers how big of tires can I fit on that truck without any rubbing? Modified vehicles are difficult to tell without measurements – you’d need to measure clearances before we could accurately assess. Give us a call and we can walk you through the process. Hi, the last word in your explanation of Wheel Adapters paragraph should be “Improperly” instead of “Properly”, if I am reading the sentence correctly. Just trying to give a helpful hint for your website to continue to be professional and technically correct. Thanks for the explanations. I really like what you said about using wheel spaces to install larger tires. My dad has a big truck and wants to raise it with larger tires, so I was wondering how he would do that safely. Thank you for the information about wheel spacers being matched with a vehicle’s bolt pattern and fitting over the existing studs to allow the wheel to be mounted normally.